An old hand at bread-making I may be, but I was a little daunted when I was recently sent an automatic Panasonic bread maker to try out. I have never used a machine to make bread before, other than an oven and I was a little concerned I would fall at the first hurdle. In truth I’ve always been a bit wary of bread makers as I’d heard they weren’t great for the flours I like to bake with – spelt and rye. The rather sleek machine that landed on my doorstep really didn’t look scary at all. I soon realised I needn’t have worried about my flours, this model comes with a speciality mode for the more unusual flours as well as a special kneading hook for rye bread – hooray. Likewise it has a gluten free program which makes it accessible to pretty much everyone. In fact it seems that virtually anything can be made in this machine: big loaves, small loaves some as big as your head, even cakes and jam, it’s what the showman said. raisin nut dispenser – additional ingredients can be placed here for automatic addition later in the baking cycle. It does not work for all programs. two kneading paddles, one for rye and one for all other breads. crust colour can be chosen: dark, medium or light. varying size loaves: medium, large or extra large. timer delay to enable overnight baking or something warm and delicious awaiting you when you get home from work. What to try first was the big dilemma. It would probably have been sensible to have made a basic loaf, but hey, it’s Christmas. Perusing the rather extensive list of recipes, I saw one for panettone – decision made. I’ve never made panettone before, or brioche, which was really the essence of the recipe. I decided to substitute the currants with chocolate – well why wouldn’t I? I also used my own candied orange peel and thought I’d add a little orange flower water too. But I was careful not to mess with the quantities; I didn’t want my first machine bake to be a dismal failure. Weighed 400g strong white flour and poured into the bread pan. Added 4½ tbsp vanilla sugar (golden caster), 1 tsp Cornish sea salt and 50g cubed unsalted butter. Poured in two medium sized beaten eggs and 200 ml milk. Added 1 tsp orange flower water, 50g chopped candied orange peel and 50g of dark chocolate chips. Placed 50g raisins in the raisin/nut dispenser and 1½ tsp instant yeast in the yeast dispenser. Closed the lid, chose the programme for brioche and waited about an hour for the machine to beep at me alerting me to the fact it was time to add a second lot of cubed unsalted butter – 70g this time. Set it on its way once again and waited a further 3 hours for the bread maker to do its thing. Eight beeps signalled the end of the process. I removed the bread pan and turned the panettone out onto a wire rack to cool – no problems at all. I was pleased that I could hardly see the hole where the paddle attachment was, a feature not shared by my mother’s bread maker. As it turned out, there were no hurdles to fall at, well maybe just a little one. The instructions were clear and the bread maker was easy to use – phew. The slight hurdle I stumbled at was that the raisins did not come out of their dispenser – this was a little annoying. It seems that this feature only works with some programs; as I later read, I was meant to add the raisins, along with the other additions, when I added the second lot of butter – oh well! The loaf tasted absolutely delicious anyway. CT, who is a big fan of brioche, was delighted. It was light, buttery and fragrant. I think everyone may be getting chocolate panettone for Christmas this year. The bread basket and dough paddle were easy to clean and really there was very little fuss involved at all. I am genuinely pleased with this bread maker. If only it would do the washing up as well. I was sent a Panasonic bread maker to try out. I was not required to write a positive review and as always, all opinions are my own. I am sending this Xmas Chocolate Panettone off to AlphaBakes with Caroline Makes and Ros of The More Than Occasional Baker. We love our bread machine, we can just never eat the bread quick enough! This sounds like a great model. Thanks for sharing your experience with the bread maker. The cost would prevent me from purchasing one–being a pensioner. But i like the sound of making your own bread in this convenient way. I used to make wholemeal bread in a wood oven back in the 70s–a hippy pasttime. hehe. Good to hear about your baking in a wood fired oven. I mostly make wholemeal bread or actually rye sourdough, but I’ve never baked it in such an oven – how wonderful. Gosh doesn’t that sound an impressive bit of kit. I’ve never used a bread maker before but I’m most definitely admiring yours, and cannot believe the amount of functions and breads it can master! I don’t know a great deal about bread makers Fiona, but this is certainly a step up from my mother’s. Looking forward to more chocolate panattone, but perhaps with the raisins this time. You were brave to try something complicated on first use, but the bread looks delicious! Thanks Suelle, I seem to have a habit of leaping in at the deep end! Oooh, Chocolate & Pannatone – yes please! We used to have a bread maker, they certainly do make baking lots quicker & the clean up easier! Phew, me too Dom. I can’t really see myself making ordinary bread in this, but for things like brioche, I can see it getting some use. I admit that bread machines are not essential bits of kitchen kit but I’d seriously miss mine if it disappeared. I probably use mine for making doughs more often than baking finished bread and it really does save me a lot of time and effort. I’m also definitely keen on the idea of a chocolate panettone. Yes Phil, making doughs in the machine seems like a very good idea and I think I will be trying this next. It has turned out great! I love esp. that smooth even crumb. Gluten free bread can be pretty hit and miss in the bread maker (I also have a Panasonic), but then, it is pretty hit and miss however you make it! 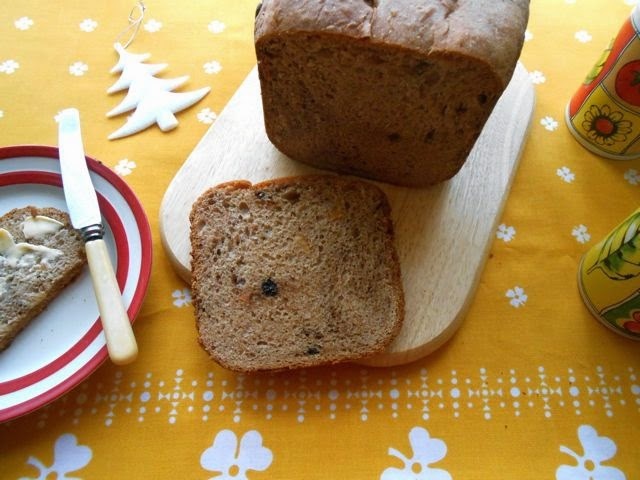 Your Panettone looks fab for a first bake…… Well done!!! Shame they don’t have a traditional panettone-shaped bread pan to bake it in! Oh how frustrating for you Kate – hit and mis bread is not at all what you want. Yes, it would be great to have the correct shape for the panettone, but I am rather pleased with it anyway. What a great idea for the breadmaker. I should have known you’d be creative Choclette. I’ve had a breadmaker for years but I don’t use it enough and I’ve never had panettone! Thanks for sharing with Alphabakes. Well you have something else to look forward to then Caroline, though I’m actually not sure I’ve ever had a real Italian one. What a fantastic first use of your bread machine! Brilliant insertion of chocolate too! Thank you Jayne. That panettone makes very nice toast too, we discovered.